Please join us as we celebrate the life of our dear friend Ed Klemmer, who passed away on February 3. 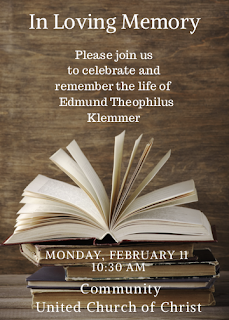 We will have a memorial service on Monday, February 11, 2019, 10:30am, at Community United Church of Christ, 814 Dixie Trail, Raleigh, NC. A reception in the fellowship hall will follow the service.